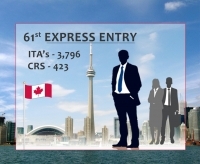 On the eve of 4th May 2017, the 61stCanada’s Express Entry draw took place, where the Immigration, Refugees and Citizenship Canada (IRCC) issued Invitation to Apply to 3796 candidates. The Invitation to Apply was given to all those who had a CRS (Comprehensive Ranking System) score of 423 or above. All the candidates who have received ITA can now submit their applications for the Permanent Residency status in Canada. The lowest required CRS score in the 61st draw is greater than that of the last draw, which was conducted on April 19. Till now in 2017 a total of 39,769 ITA’s have been issued which is higher than the total number of the ITAs issued during the year 2015 or 2016.